As the 1970’s spirit lives on, so does Woodstock’s sense of style. In Fox Chapel Publishing’s new Woodstock-themed journals, lovers, dreamers, artists, and angels are invited to pen their thoughts and dreams in a gorgeous variety of lined, unlined, and dot journals. The ten journals feature photographs and illustrations from the greatest festival of all time. New dot journal series featuring iconic photographs and illustrations from the legendary Woodstock Music & Art Fair. The festival’s 50th Anniversary is guaranteed to draw massive media attention. Woodstock was a pivotal moment in popular music history that defi ned a generation and continues to inspire. For a sneak-peek, visit the Wellspring booth at the Atlanta Gift Show in 2018. The journals will launch in March 2018 under Fox Chapel's new imprint Quiet Fox. I received a Woodstock Dot Journal to review. It is really cute. Of course, I wasn't born when Woodstock took place, but I have heard about it over the years. It is cool that the 50th anniversary of Woodstock is being celebrated! 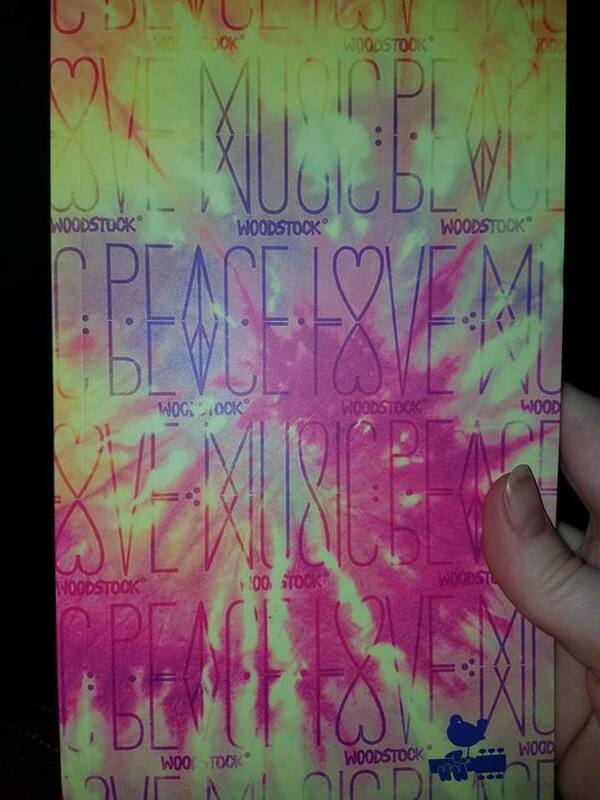 Packed with iconic Aquarian images, Woodstock Dot Journal Peace, Love, Music makes it easy to manage your life! Now you can combine your planner, diary, and to-do list all in one pocket-sized book. This efficient dot journal lets you jot down quick notes instead of writing long sentences. With innovative features like rapid logs, signifier notations, and index updates, it helps make maximum use of your limited time. Track your day-to-day activities and organize your long-term goals with inspiration from the greatest music festival of all time. Memorable photographs and psychedelic illustrations connect you every day with the Woodstock ideals of peace, music, and love. The dot style, as opposed to the regular lined journal pages make it fun to write down my thoughts on a daily basis. This journal is really coming in handy right now because I am on a diet! I am using it to keep track of the food I eat, so that I can get a better idea of where I am getting my calories and how I can improve my eating habits. Buy your Woodstock Journal here.